Many people want to start a Watkins business to make extra income but what if you don’t have any money to invest in getting started? No problem, if you are willing to invest your time and do a bit of work, you absolutely can do this. 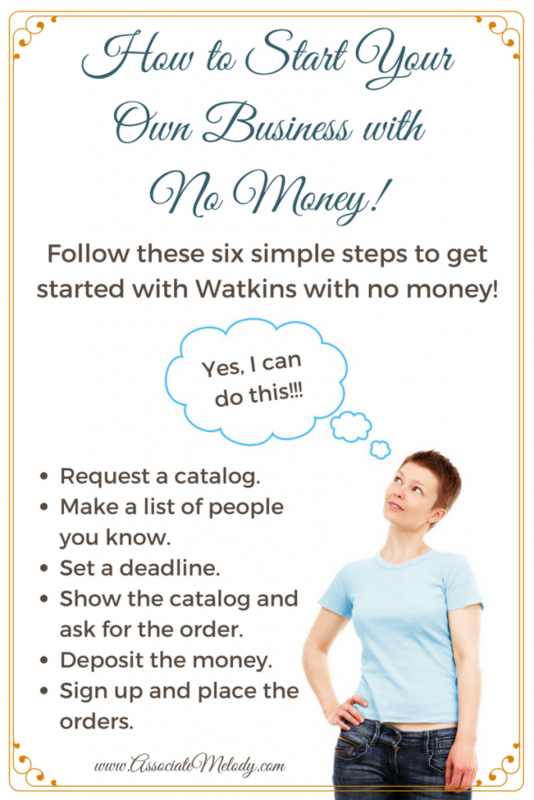 Here’s how to start your own Watkins Business with no money! 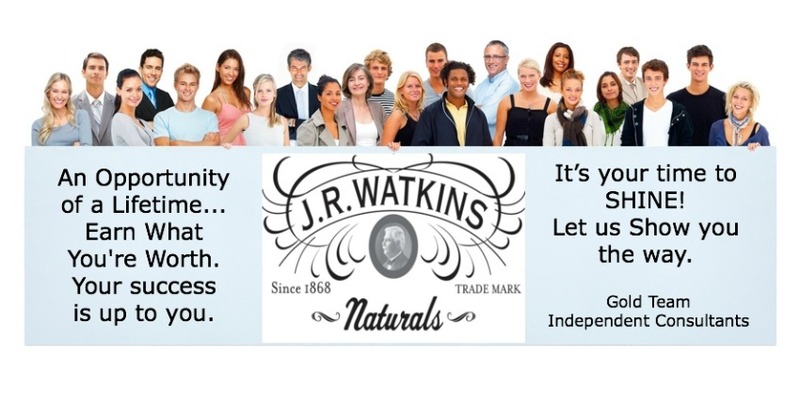 Starting your own Watkins business can cost as little as $29.95 plus sales tax. Ideally, you’ll also want to invest in some catalogs and sales aids but we realize this isn’t always possible for people with a limited budget. This simple plan will cover the cost of your membership and a few supplies to get started or give you a little extra cash. Your success is up to you! Set your sales goal, in this case, we suggest you set a goal of $200.00 in sales to pay for your membership or $250.00 in sales to cover your membership, catalogs, and other supplies. Set a deadline for your goal, usually one to two weeks and take action to reach your goal. Request a business information package from me, simply scroll down the page and fill in the form after you read the steps. Your package includes a Watkins products catalog so you can get started as soon as it arrives in the mail. Deposit all the money you collected into your bank account. You should have approximately $220 to $275 plus sales tax if applicable. See the tips and tactics below. Then call me to help you sign up and place your customer’s product order and supplies. Note: there maybe sales tax on your membership fee of $29.95, catalogs and business supplies. Congratulations you are now officially a Watkins Consultant! You’ll want to charge your customers a 10% handling fee, this helps increase your income, we’ll teach you about this and other smart tactics when you join us. If you live in the US and you don’t have a bank account with a debit card, another option is to use a prepaid credit card. Simply load all the money you collected for the orders onto the card and use it to pay when you join and place your orders. If you live in Canada you will need to use a major credit card to pay for your membership and first order, the option to pay by debit or prepaid credit cards is not available in Canada. We do have an option to set up future payment through your chequing account once you’ve joined. If you deposited funds you collected for orders into a bank account but paid with a credit card, a tactic to avoid having to pay interest is to make a payment on your credit card right away. I’m available to help you every step of the way, from the most effective ways to get orders to navigating your Watkins account and the ordering system. If you can follow this simple plan, repeat it consistently every week or two, and take advantage of the additional tips and training available, you will achieve the success you desire! What are you waiting for? Request your free catalog and business information now! Know someone else who could benefit from this information? Be a hero, share it with them!